This article will explain what an iframe is, how they are currently used, and how they can affect your search engine optimization. <iframe src="URL of page you wish to embed"></iframe>. As mentioned above, iframes are used to embed one web page into another, and there are many purposes for which iframes are the best solution. They be useful when you have a content page that requires a specific component from another site, but you cannot or do not want to duplicate that content or embed the other site's provided code. YouTube uses iframes in its embed code for when you wish to place a video on your web page. SlideShare uses iframes the same way to embed presentations. Gmail announced in 2010 that it would begin using iframes to make it so you can continue working on popped-out emails even if you close the parent inbox window. Some use iframes to display PDF articles within the page instead of requiring the user to click the link and download a separate PDF. How do iframes affect SEO? When using iframes, it's important to understand the potential implications for your search engine optimization efforts. One client asked if using iframes would cause duplicate content issues, or if it is considered cloaking in the eyes of the search engines. Some have also asked whether the content within the iframe will help the search engine optimization of the page in which it's embedded. I'll address each of those questions in turn. Do iframes Cause Duplicate Content Issues? No, the use of iframes should not cause duplicate content issues. When search engine spiders crawl your page, they typically have difficulty comprehending frames and do not crawl and index the content within the <iframe> as part of the content of the page it's embedded on. Therefore, they should not perceive the iframe content as duplicative of its original page. Some experiments have shown that Google crawlers can crawl the contents of an iframe and follow its links, but Yahoo! and Bing crawlers cannot. The search engines will see the source URL in the snippet of HTML syntax, and they give credit to the original page from which the content came. The page where you have embedded the iframe will not receive credit for any of the content from the original source within the iframe. Is Using iframes Considered Cloaking? The definition of cloaking (a black hat SEO technique that can lead to penalty and is not a recommended tactic) is showing users who visit your web page different content than what you show search engines. By this definition, using iframes would not be considered cloaking. Search engines that crawl your page with an iframe can clearly see within the iframe syntax the source URL of the content you are embedding. Therefore, you are not showing two different things to search engines and website visitors. Can Content in iframes Help My SEO? The short answer is no, not really. Once again, the content and links within iframes are not typically crawled and indexed, and credit is definitely not attributed to the page where iframes are embedded. Because the content within the iframe is attributed to the source URL and not your own page, iframes to not offer any inherent SEO value for your on-page optimization. When it comes to iframes and SEO, they appear to neither directly help nor hurt your on-page search engine optimization. There are still several viable uses for iframes in web development and design today, but SEO is not typically one of them. Focus on creating high-quality, relevant, unique content to avoid duplicate content issues rather than relying on iframes, and instead allow iframes to serve their intended purpose, like the ones outlined above. Consult with your search engine optimization specialist and/or web developer on whether iframes are the right solution for you. This article about iframes and SEO is written from the perspective of a search engine optimization specialist and inbound marketer, not a developer. For a more advanced, in-depth view of how to properly use iframes, I recommend this informative article from W3Schools.com. Thank you so much for clearing the myth that Iframe will do harm to a website with iframe elements embedded. I’d been quite concerned about the warning issued by a couple online SEO checking tools against the use of iframe on my site, which is kind of unavoidable. Now, I’m relieved to hear your clear and spot-on explanations. I’m also very impressed by the way you presented your views. Thanks for Explaining about the common myth regarding iframes. I had to post some ads on websites and the only way to post some good text and image ad was to use iframes. But I was worried about google crawler. No after reading your article I have gained some confidence to include iframes and make the website more attractive. What’s the difference (SEO Effect) of outbound link and Iframe ? Hi: Thanks for clarifying this as I agree there is a lot of confusion out there about how iframes influence (or don’t influence) SEO. First, I should say I agree with your logic and believe you are correct. For me, the big remaining question is, Why don’t more sites use this technique? There are lots of sites that want to be an authority on a particular subject matter. No site can possibly create all the content relevant to the subject on their own. Therefore, to be the real authority it would seem beneficial to display your own relevant content and also show relevant content from all the other relevant sites. Instead of using iframes, the vast majority of sites out there simply link to the other relevant sites but of course the site operator is then sending the traffic away from their own site. So, why wouldn’t more sites simply display frames for the relevant sites and keep the user on their own site instead of sending the traffic to another site? It seems like there must be some reason site operators don’t use iframes or even multiple iframes on their sites. In fact, I can’t seem to find any large scale sites using iframes or multiple iframes in any meaningful way. Do you have any insight into why iframes and multiple iframes are not more commonly used to display content from other relevant sites? Sorry but this is *not* true. I came across your article after finding a massive big issue on our website of duplicate content. 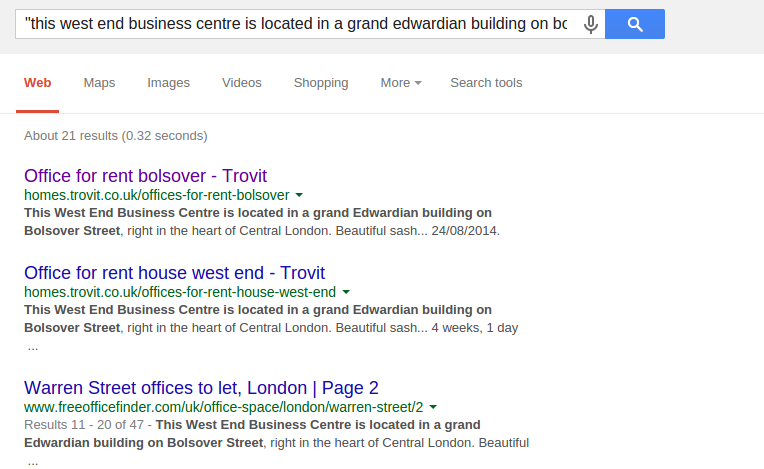 Basically a 3rd party website called Trovit has been using an iframe to render all of our offices. I have an important question. I regularly make unique contents and my store has so many products and that being said, my website has been the target of iframe websites. I can see so many links from Google webmaster linking to my website. Does it affect my wbesite SEO if I block iframe website? I mean are those backlinks valuable for my SEO? and more important question is, do iframe websites, use my resources (server) ? However, if you use a sitemap generator they may very well be! Randy that’s partially true. Nowadays the bots do crawl the information within the iframe. The problem is that the information is from the iframed site and they are the ones who are benefiting from the seo attribution. You don’t have a duplicate content risk but the information isn’t necessarily attributed to you. Iframes are causing negative effects in Google Analytics. I put iframed content to my page and noticed weird things in Google Analytics. The content in the iframe is from the same domain, so no external sites. The problem is that after inserting iframed content, Google analytics “average time on page” and “bouce rate” went to worse direction. So Average time on page went down and bounce rate went up. These metrics are bad for SEO because now, at least Google Analytics sees that the page is not interesting anymore because people bounces or spend less time on the page, even they are not. So when user starts to use the content in the iframe, and in my case they spend lots of time in it. I also inserted GA tracking code in the iframed content but that didn’t help. I finally removed the iframes and GA metrics went back to normal. But the thing is that I am not able to dispaly this content in any other method, iFrame is the only choice. I was worried that my facebook like box which uses iframe is hurting my seo, but this post cleared my doubts! Thanks a lot. how much its possible that search engines consider iframes in future? and if there is a strong possibility then when?